While in the midst of the craziness – otherwise known as the football season - it dawns on me this time of the year is our “social season”, that is a chance to visit with others who we may not see for months at a time. Of course, the approaching holidays have much to do with that, but as Floridians we view the fall as a time to reconnect with others, since many of us flee the drenching heat and humidity of the summer months. You see, most of the country views summer as a time to visit and vacation, while we see it as a four to five month slog, to be endured until we reach the days when the mercury finally slips below 90. This brings me to football. It may seem strange, but it’s true that with the onset of fall comes a time to visit with those who have been away and naturally, the football field acts a gathering place to renew acquaintances and see loved ones. Having grown up in a professional football city, I never understood the cultural impact of high school and college football in the South until I moved here, but it’s undeniable. And it’s not unique to us. Other parts of the country similarly look forward to those days when they can trot out their favorite sweater or jersey, hoist a pennant (and their favorite adult beverage) and cheer the local squad to victory. If you win, great; if you lose, it’s communal suffering. And this is not unique to Florida. Having lived in the Midwest, I can appreciate the rivalries which underscore that part of the country and no rivalry is more intense than the ones in the state of Michigan (you know where this is going, don’t you?). 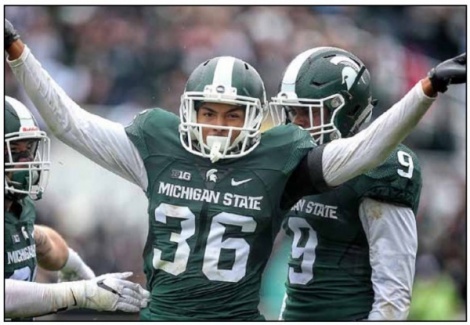 The once-in-a-lifetime finish between Michigan and Michigan State, where on the last play of the game the Michigan punter fumbled the snap and proceeded to kick the ball to a MSU player, who promptly scored with no time left, is a play generations of football – no, sports – fans will talk abut for years to come. Which is to say we care about these outcomes because they’re part of who we are – both as a people and as fans, because it gives us an identity, and that’s very important in an increasingly impersonal and cold world. So good luck to your squad, enjoy your barbecues, and savor the moments, because they don’t last forever. Don’t believe me? Just ask your favorite Michigan fan. Mark Tudino is an attorney with offices in both Miami-Dade and Broward counties, whose practice specializes in all areas of civil litigation. He has lived in South Florida for more than 20 years. Prior to attending law school, he was a political and sports reporter for television stations across the country. His career allowed him to cover everything from presidential e l e c t i o n s t o national championship sports teams, and he still maintains a passion to observe and discuss the world of sports.